It’s the week after Thanksgiving, which means, uh-oh December is approaching… better get on it! December brings hope and fear, worry about getting the right present, concern about having the “perfect” holiday, yet also wanting to be peaceful and spiritual and generous during this season. Plus it’s the end of the calendar year, with all that entails. It’s a contradictory time of year with red hot emotional buttons. This December is especially fraught with meaning, since December 21, 2012 is approaching, which many claim is the end of the world, according to the Mayan calendar. Kind of like the Y2K end of the world hubbub 12 years ago. In honor of the end of the world, which may or may not happen this December… I played with Photoshop. I couldn’t think of anything else to connect with MauiShopGirl’s photo theme, “Aftermath of Thanksgiving.” I've already talked about turkeys, and leftovers, and all of that. Will this car stop working because the odometer reads 2012? Nah, it’s just a photo. 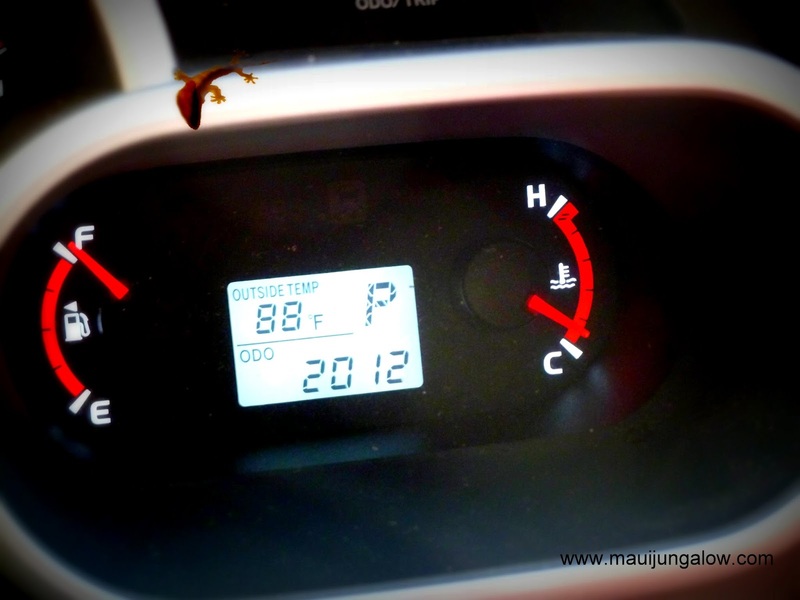 The gecko looking at the odometer is a fun add-on because we have lots of geckos here, and sometimes they get in the car. We even had an anole lizard try to drive the truck! I prefer to believe that the world will keep on ticking past December 21, 2012… just like this car will keep driving past 2012 miles. I’m hopeful. 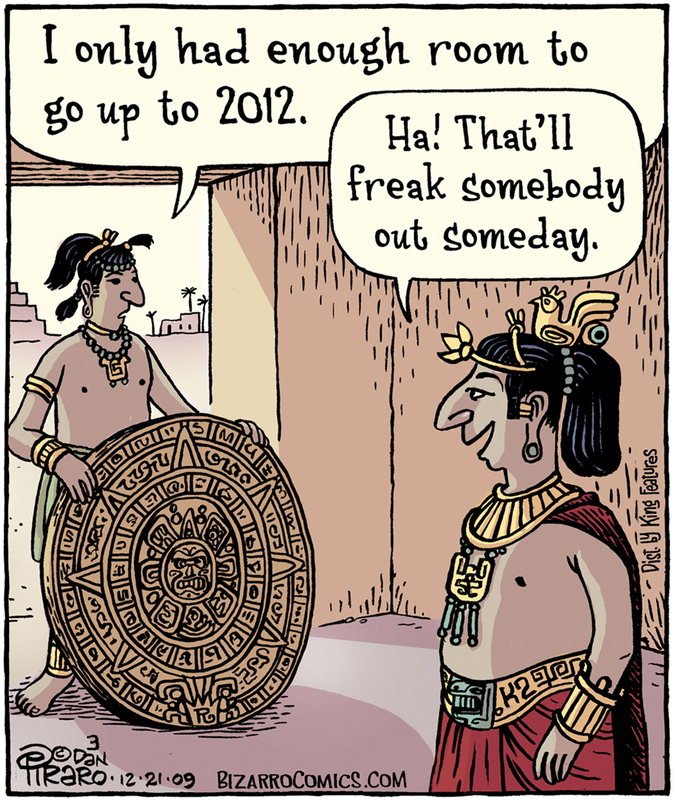 which pokes fun of "end of the world" Mayan calendar theory. Posted by permission from Dan Piraro. So I'm still making goals and planning to live life in 2013. Just yesterday, I worked on a new header, using this great tutorial on making a header without photoshop. I also found another header tutorial using picmonkey.com and may play with that too. Version 1 of the header...it wasn't wide enough. Version 2 is the header now. But if the end of the world happens, let it be the end of a small-minded, short-term profit-making, “my religion is better than your religion,” "success at all costs" world. I would celebrate the end of a world in which we think that what we do, good or bad, has no effect on anyone else’s life. I would be happy to see the end of a world in which short-term profit is more important than people’s lives, and their children’s lives, and the environment. The end of a world in which religion is used to justify killing, hatred, and oppression is ok by me too. I'd applaud the end of a world in which "the ends justify the means," but rather how we do things, our process of doing them... the "means"...are just as important...as the results we want to achieve. That would be an end of the world worth celebrating. Okay, time to get off my soapbox.